Jobs – Nadine Bocelli & Company, Inc. – New York Legal Staffing, Inc.
Search Our Career Choices Today! Do you like these job search results? Litigation Support Paralegal - Immediate Hire! Our legal recruitment firm has been working diligently with many large, medium and smaller sized law firms in compiling an impressive list of Attorney employment opportunities for your review and consideration. These Associate Attorney legal staffing opportunities are available to Attorneys in all areas of specialization. If you are currently in the market searching for a new employment opportunity, we invite you to email your resume. Our New York law firm clients are looking to hire junior paralegals/ legal assistants with a minimum of two years of litigation experience. The successful candidates must be able to demonstrate knowledge and understanding of the litigation process. Trial experience is a plus. Four-year college degree required, paralegal certification helpful for open positions. Excellent compensation packages. Commensurate with experience. Several of our law firm clientele are seeking recent college graduates with administrative and secretarial skills to train in the legal profession as paralegals, legal assistants, legal secretaries, recruiting/ HR Assistants, records clerks, information technology/help desk, etc. Direct hire, temp-to-perm and/or temp legal jobs. Provide support to partners, shareholders and associates in various practice areas. Excellent organizational and prioritization skills, interpersonal and teamwork skills. Must be able to take initiative and work efficiently with higher-order thinking skills. Knowledge of general office procedures. Candidates who are motivated and adaptable will best fit these available opportunities. Excellent training programs. Proficiency in Word and a minimum typing speed of 55 wpm required for the administrative positions. Here’s a partial listing of benefits offered within these various NYC law firms. Immediate eligibility for medical and dental, prescription plan, generous vacation, health club memberships, transit plans, company cafeterias, company discounts, social functions, attendance awards, annual reviews, 401(k) plans, life insurance, short term and long term disability plans, flexible spending accounts, and much more! Midtown Manhattan intellectual property law firm seeks an associate attorney with 2-5 years of patent prosecution experience in mechanical or technical background. US and foreign prosecution. Registered and eligible to practice before the USPTO. Strong written and verbal communication skills are essential. Superior academic credentials. Competitive salary and benefits package. A well-established midtown Manhattan law firm is looking to hire a smart, proactive and personable legal administrative assistant to support three hi-profile entertainment attorneys (a named partner, partner and counsel). Responsibilities will include managing general administrative duties such as filing, answering phones, scheduling meetings and calls, correspondence on attorneys’ behalf, logging and submitting receipts for reimbursement, and light paralegal work (preparing engagement letters, editing and revising entertainment contracts documents, note taking etc. ); scanning documents; managing attorneys’ entire billing process including inputting time sheets, sorting bills for review and scanning/emailing bills out to clients; and writing first drafts of emails and letters. Assist other secretaries with overflow work and provide backup legal secretary support during vacations, leaves of absence, etc., and provide backup support for reception, conference room and office services functions. Work Schedule: Monday – Friday, 9:30 am – 5:30 pm. All relationships treated in confidence with utmost discretion and privacy. 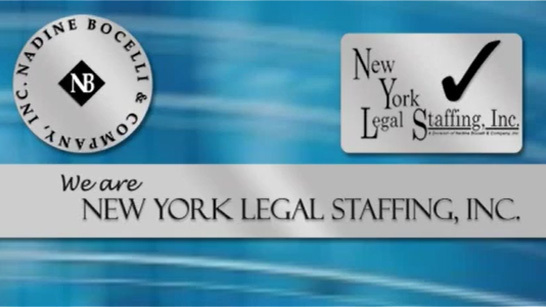 Nadine Bocelli & Company, Inc. - New York Legal Staffing, Inc.
Additional and exciting new legal job opportunities each and every day!